The PARLe platform of the Cyberjustice Laboratory was granted the 2018 Public Administration Award of Excellence (Digital Initiatives Category) from the Institut d'Administration Publique du Québec (IAPQ). Office de la protection du consommateur, Ms. Ginette Galarneau, President of the Office surrounded by her team, Mr. Éric Caire, Minister Delegate for Digital Government Transformation and Mr. Benoît Boivin, partners in this award, and Mr. Richard Audet, President of this jury. 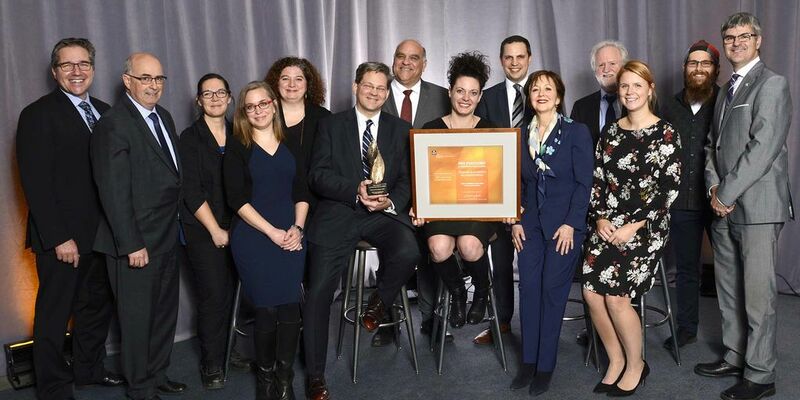 Montreal, November 30, 2018 - The PARLe platform is once again recognized by the IAPQ as the winner of the 2018 Public Administration Excellence Awardin the Digital Initiatives category, as part of the online consumer mediation pilot project conducted with the OPC. The announcement of this award coincides with the renewal of this project and of the partnership between the OPC and the Cyberjustice Laboratory (for the third consecutive year, starting November 1, 2018). After receiving the 2018 Award for Innovative Management from the Institute of Public Administration of Canada (IPAC) for its use at the Ontario Condominium Authority Tribunal, the PARLe platform and the Cyberjustice Laboratory were once again awarded. Launched in 2016 by the OPC, the online mediation project provides consumers and merchants with a platform for online mediation, negotiation and resolution of their disputes. As of October 1, 2018, nearly 70% of cases have been settled on the platform within an average of 28 days, satisfying 88% of consumers and 90% of merchants. The Director of the Cyberjustice Laboratory, Professor Karim Benyekhlef, is delighted with this success and with the once again rewarded excellence of the PARLe platform: "This is an innovative, effective platform whose main objective, I remind you, is to provide better access to justice for Quebecers” (translated from French). The Cyberjustice Laboratory, which is housed at the Université de Montréal with a satellite room at McGill University, is a hub for thought and creativity where justice processes are modelled and re-imagined to improve access to justice. As a specialist in online dispute resolution and the modernization of justice through digitization, networking and the use of artificial intelligence, the Cyberjustice Laboratory develops platforms, software and chatbots that facilitate the daily lives of litigants and professionals in the judicial world. This content has been updated on 12/13/2018 at 13 h 06 min.